When everyone else is in the dark, you can count on an uninterrupted power supply to continue your operations per usual, with a generator backup system from B&B Electric. Your systems must be able to operate for your business to function. When the power goes out, so do the telephones, computers, and other critical pieces of equipment. Loss of power could lead to unproductive time, loss of business, and loss of money. There is nowhere that loss of power is more impactful than at a hospital. Hospitals are the life support system of a community in both times of crisis and by providing general healthcare needs. When an outage occurs in a hospital, the power that is vital to the operation of life support machines and other necessary tools to sustain life must be provided by a generator. Whether a storm or general blackout occurs, people need to be assured their care will not be interrupted and power will be provided by an alternative source. B&B Electric has the expertise to install and maintain generator systems that will ensure the care of you or your family member is not affected when outages occur. What types of generators can you work on? Our technicians are educated on all makes and models of generators, from 500 watts to 2,000 kw, to service all customers. 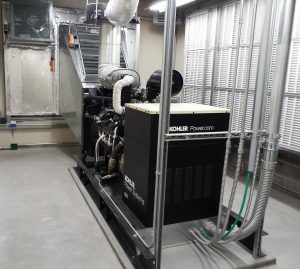 Do you provide a temporary generator if necessary during upgrades or maintenance? In some cases, the generator power is required 24/7. While the service is performed, the generator will not be operable for the facility. We have back up systems to temporally hook during the generator testing if required. What does typical generator servicing entail?